Palestinian refugee camps in Lebanon are often depicted as “no-law zones”: rise of Salafist-Jihadist factions, inter-related military networks between some Lebanese, Palestinian and Syrian groups. Nevertheless, the camps are full of sharp contrasts, and cannot be reduced to Salafist radicalization. An Islamist scene with a nationalist agenda limits for the moment the ascent of extremist factions. Violence and insecurity are not only due to the Jihadist phenomenon: the internal dissensions of Fatah also play a capital role in the ongoing deterioration of the situation. For Lebanese and Palestinian stakeholders, the challenges are multi-fold. They are not able to confront one of the most important factors of radicalization: the constant socio-economic deprivation of Palestinian refugee camps in Lebanon. But on the security level, some positive steps have been accomplished. The Lebanese army and its intelligence apparatus are not totally in an antagonistic relation with Palestinian actors. Despite their divisions, Palestinians organizations, from Islamists to Nationalists and Leftists, cooperate with each other. Even if they remain fragile, an inter-Palestinian mediation process and a constant dialogue with Lebanese authorities are surely a precondition to face Salafist radicalization. To cite this paper: Nicolas Dot-Pouillard, "Between Radicalization and Mediation Processes: a Political Mapping of Palestinian Refugee Camps in Lebanon*", Civil Society Knowledge Centre, Lebanon Support, 2015-10-01 00:00:00. The 12 Palestinian refugee camps in Lebanon,1 which consist of 250.000 to 400.000 people,2 are commonly regarded as “no-law zones” and "spaces of exception".3 The political representativeness crisis is the main source of the constant security instability in the Palestinian refugee camps in Lebanon. Over the past twenty years, the Palestine Liberation Organization (PLO), whose headquarters was moved from Tunis to the Gaza Strip and the West Bank, since Oslo Accords in September 1993, has been increasingly losing its legitimacy in the camps, whereas in the past, it was the cornerstone of their social, political and military organization. From the beginning of the 1990s, PLO’s prerogatives have been gradually reduced in favor of some Palestinian military and political organizations associated with the Syrian regime, called At-Tahalluf or Palestinian Forces Alliance (PFA).4 This trend was also intensified due to the growth of groups labeled as Islamic or Salafist-Jihadist, sometimes armed. This became especially true after 2005 during the Syrian troops’ retreat. After being under Syrian control, the Palestinian political spectrum has become increasingly pluralized: as a result it has become increasingly fragmented, threatening a relative past Palestinian political cohesion. Today, the Palestinian question in Lebanon is considered from the sole perspective of the Salafist armed groups, which are living within the camps, and are substantially contributing to a process of political destabilization in Lebanon by confronting the Lebanese Army and the Internal Security Forces (ISF), and also by collaborating with existing armed groups in Syria, like Jabat an-Nusra (JN) the official al-Qaeda (AQ) affiliate in Syria. Those armed groups are diffusing a radical Sunni discourse counter-current to Hizbullah and to, in general, Shiites, that echoes the fundamentalist narrative currently promoted in Syria and Iraq. This perspective is nothing new: it has already been considered since the Nahr al-Bared conflict of 2007. From May 2007 to September 2007, Shakir al-Absi5’s Salafist movement, Fatah al-Islam, which gathered Palestinian fighters along with Lebanese and other Arab members, engaged in combat against the Lebanese army. After the fighting, Nahr al-Bared camp had been ravaged and its approximate 30.000 inhabitants were consequently displaced. The current Syrian crisis and the subsequent influx of 53,000 Palestinian refugees from Syria into Lebanese camps emphasize the concern about the Jihadist and Salafist phenomenon.6 As a result, Ain al-Hilweh - Saida’s main refugee camp - became the headquarters for some Salafist-Jihadist armed groups (mainly Shabab al-Muslim, Fatah al-Islam, Jund al-Sham, Musala al-maqdissi and Abdallah al-Azzam Brigades). Those groups, opposed to the Lebanese army and Hizbullah, maintain close political and security ties with some factions of the Syrian opposition, especially Jabhat an-Nusra. That is how the Syrian crisis, with its political and military implications, is reverberating in the Palestinian refugee camps in Lebanon. However, exploring the Palestinian refugee camps in Lebanon solely from the Salafist-Jihadist angle would be a reductive approach. This is because, first, the Palestinian Islamist sphere in Lebanon does not consist of this unique trend, but comprises several Islamist movements, like Hamas, the Islamic Jihad Movement in Palestine, Usbat al-Ansar and Ansar Allah (an Islamist organization, closely related to Hizbullah). Palestinian Islamism in Lebanon is a multifaceted and plural reality.7 Secondly, political dissensions within the Fatah Movement add to the political instability, which is also reinforced by a general crisis of Palestinian leadership in Lebanon. Lastly, social insecurity oversteps the Salafist armed groups’ scope. Tensions are growing between the Lebanese army and Palestinian refugees, especially in Nahr al-Bared. The rising social claims of Palestinian refugees have to be taken into consideration. Poverty, precariousness and unemployment, mixed with a total absence of political outlooks for Palestinian refugees in Lebanon, are also factors of social insecurity. Sexual harassment, informal Lebanese-Palestinian criminal networks around the camps, especially in Chatila and Burj al-Brajneh refugee camps,8 drug smuggling, trafficking of small arms and light weapons, prostitution are all the consequences of those threats felt in the everyday life of Palestinian refugees. This does not mean that the situation is only negative, and characterized by a permanent instability. The Palestinian NGO’s and their social workers, the Popular committees and an informal system of everyday solidarity, and a collective memory and a common national imagination9 help Palestinians maintain social cohesion. On the security level, a certain dialogue exists between Palestinian factions. The refugee camps’ insecurity often conceals processes implemented by Palestinians and Lebanese to contain the violence, like the coordination between the Lebanese army, some Lebanese officials and various Palestinian organizations. The attempts to set up a Palestinian Joint Security Force for several months and the Lebanese-Palestinian dialogues on security and politics are dissimulated by the prevailing insecurity in the camps. They are also hidden by a prevalent discourse and a “common meaning”, often fuelled by Lebanese and International medias, depicting the Palestinian refugee camps in Lebanon as permanent unstable spaces. The continuous mediation efforts made by the Palestinian and Lebanese stakeholders are certainly undermined by some difficulties. A resolution focused on purely security is not an answer for the socio-economic deprivation, which is the main causal factor of the radicalization to which the refugees are subjected. But those efforts somewhat allow to question the very image of “no-law zones” that damages Palestinian refugee camps. The concept of “Islamism” could seem ineffective to describe the vast reality of Palestinian groups inspired by a religious ideology. These Islamist groups are often divided, and do not share a common political vision. Some of them mix the Islamic thematic with a nationalist agenda, while others are inspired by a transnational and Pan-Islamic vision. Salafist-Jihadist movements are strengthening their ranks in the camps, developing clandestine networks with some components of the Lebanese and Syrian Jihadist sphere. On the contrary, other organizations, also described as Salafist, are fully part of the Palestinian nationalist landscape in refugee camps, sometimes playing the role of mediators between Jihadist groups and Fatah movement. Hamas and Palestinian Islamic Jihad try to contain the rising of radical factions sometimes affiliated to al-Qaeda. On the one hand, Palestinian camps become, more and more, a shelter for extremist groups; on the other hand, a multifaceted Palestinian Islamist scene obviously limits their progression. Ain al-Hilweh, a Transnational Salafist Laboratory ? To this day, Jund al-Sham coordinates its activities in Ain al-Hilweh accordingly with other factions which claim their affiliation to the Salafist-Jihadist movement, and, sometimes, to the political and religious leadership of al-Qaeda. These groups consist mainly of Palestinian fighters, but also comprise Lebanese, Syrian and Saudi members. Among them, Fatah al-Islam, led by BilalBadr,after having been expelled from Nahr al-Bared subsequently to the summer 2007 conflict with the Lebanese army, and whose headquarters are currently in Ain al-Hilweh, and Abdullah al-Azzam Brigades, who claimed credit on Beirut Iranian Embassy attack in November 2013. Most of these Salafist organizations are settled in Taware and Tamire districts,11 alongside Jund al-Sham. Abdullah al-Azzam Brigades’ Saudi leader, Majid al-Majid, took refuge in Ain al-Hilweh at the end of 2013, until his capture by the Lebanese authorities. He was suspected of planning a series of attacks in Southern Beirut (al-Dahiyeh), a Hizbullah stronghold, during the summer of 2013.15 Those attacks were a response to the active participation of Hizbullah forces in the Syrian war on the side of the government’s army. Lastly, some young Palestinians from Lebanon are now engaged on the Syrian front alongside the Islamic State (IS): last June, the Lebanese press announced the death of Ahmad Horeish (Abu Moussab al-Maqdissi) in Syria, a native of the Ain al-Hilweh refugee camp, during combat involving IS.19 Nevertheless, the political rise of the Islamic State in Palestinian refugee camps in Lebanon remains limited, although this organization is seeking to expand in the country. In general, Palestinian Salafist groups are closer to the Support Front, and still follow pro-al-Qaeda political trends. This pro-al-Qaeda affiliation, for Palestinian radical Salafists, limits for the moment the political ambitions of the Islamic State in the camps, because both organizations have been militarily opposed in Syria since 2012. In addition, one of the fiercest opponents to the Islamic State remains the Hamas movement, whose fighters, in Syria, have fought the organization of Abu Bakr al-Baghdadi during the spring 2015 in Yarmouk’s refugee camp, near Damascus;20 in the Gaza strip as well, tensions arise between Hamas and IS. In Lebanon, Hamas is thus totally opposed to a military implementation of IS in Palestinian refugee camps. Ain el-Hilweh refugee camp seems to be at the core of transnational and global dynamics, despite its de facto state of siege and its enclosure by the Lebanese army: the ancient presence of Salafist-Jihadist organizations in the camp, with a strong Palestinian component, is a breeding ground for the creation of interrelated Salafist-Jihadist networks, finding in Ain el-Hilweh their political shelter (Malja’). The Syrian crisis reinforces now their radical narrative. Nevertheless, these Salafist-Jihadist networks are not in a situation of total hegemony: they have also to cope with a pluralist Islamist scene. Paradoxically, most of the time, security tensions within Ain al-Hilweh refugee camp tend to end with a virtually immediate ceasefire between the different warring parties. Whenever Fatah, or an organization affiliated to the Syrian regime, or a Palestinian leftist political organization are targeted by some Islamist groups, there is systematically an arbitration initiated by another group. Ain al-Hilweh’s Palestinian Islamist scene is undeniably multifaceted. Since the early 1990s, the camp has been hosting a large number of groups that claim to be fundamentalist or Salafist, or both, but who occasionally share different political orientations. They maintain a presence in the political and military sphere and compete with PLO’sor the AllianceofPalestinian Forces’s affiliated groups supporting the Syrian regime, while advocating consistently a tripartite mediation process. The three stakeholders in Ain al-Hilweh’s recurrent crisis are the Lebanese authorities, Salafist radical movements and the main Palestinian political parties in the camps. At the end of May 2015, an agreement has been negotiated between Taware and Tamare’s Shabab al-Muslim and the Higher Palestinian Security Committee led by Sobhi Abu Arab, a Fatah member. A Palestinian Joint Security Force, composed of about a dozen movements and among others, PLO affiliates, is allowed to patrol areas where Fatah al-Islam, Jund al-Sham, and Abdullah al-Azzam Brigades are based.21 This temporary but substantial agreement was concretized under Usbat al-Ansar’s (League of the Partisans) mediation. Founded in 1985 by Hisham Shreidi,22the movement is now led by Sheikh Abu Sharif al-‘Aql. Usbat al-Ansar was initially close to Palestinian movements that were opposed to Yasser Arafat. It remains one of the major Palestinian fundamentalist organizations in Ain al-Hilweh refugee camp. Usbat al-Ansar is able to maintain a constant dialogue between radical Salafist factions and the conventional Palestinian movements like PLO or Hamas23 because of its conveying of radical Sunni ideas which lend them credibility in the eyes of Salafist movements, and because of its historical foundation in Ain al- Hilweh camp since the mid-80s. Ansar Allah, Jamal Khattab’s Combatant Islamic Movement and Usbat al-Ansar have a common specificity: they are only implemented in the Palestinian refugee camps of Lebanon, more specifically in Ain al-Hilweh. Their political influence is purely local, often related to the charismatic direction of their religious leadership and “Sheikhs”. Unknown in Palestinian Territories and in the rest of the Palestinian diaspora, they are the reflection of a specific history: that of southern refugee camps in Lebanon. Since they find their origins in the mid-80’s, they are completely able to deal and to negotiate with the Fatah movement and with PLO affiliated factions, with which they have a common – and sometimes disputed- history and a shared political space. They are used for political transactions with movements whose ideological background is different. On the other hand, their Islamic and radical discourse serve to contain, in the most recent period, the political rising of some Salafist-Jihadist factions: these factions are often obliged to cope with their relative religious and political ascendency upon some areas of Ain al-Hilweh. The last stakeholders of the Islamist arbitration that contributes to containing the conflicts in Ain al-Hilweh camp are Hamas and the Islamic Jihad Movement in Palestine (also called Palestinian Islamic Jihad, PIJ). Far from Salafist movements, both are very well established in the Palestinian refugee camps in Lebanon. Palestinian Islamic Jihad which maintains good ties with Iran and Hizbullah, and a moderate approach regarding Syrian crisis, officially advocates an all-out dialogue policy with all the factions involved in the Palestinian refugee camps. This dialogue policy is every now and again, reiterated in the monthly publication of their Lebanese branch, Al-Jihad, where the main leaders of the Palestinian Islamist spectrum are regularly allowed to express themselves, alongside PLO’s representatives.26 Its policy is basically to avoid any military or political conflict with any faction in Lebanon, and to strive for global reconciliation with all the factions present in the refugee camps. On the other hand, The Hamas movement is systematically trying to play on several sides. Firstly, in its Syrian policy: Hamas is resolutely opposed to the Bashar al-Assad regime, and its officials left Damascus in December 2012. As a result, Hamas attracts the sympathy of some Salafist and Islamist Palestinians, strongly opposed to the Syrian regime and to Hizbullah. At the same time, Hamas seeks to preserve its relationship with Hizbullah and with Iran, despite their divergences over the Syrian crisis: it is partly due to the fact that Hizbullah and Iran remain, to a large extent, its main financial and military providers. In Lebanon, it advocates a position of full political neutrality between all the actors: the Lebanese State, Hizbullah and its opponents, the Palestinian parties, whether PLO-affiliated or not. Its official representative in Lebanon, Ali Barake, and its representative for International Affairs, Osama Hamdan, who is also based in the southern suburb of Beirut, a predominantly Hizbullah’s stronghold, often work on politics of mediations between all these components: Hizbullah, the Lebanese authorities, the radical Islamist factions in the camps, despite its own political stances on the Syrian file. In February 2015, Hamas launched a campaign,27 "Stop Incitement and Violence" (La li-l-Tahridh wa la li-l-‘Unf), and engaged with Lebanese authorities to restore security in Palestinian refugee camps, while working on progressive policies and seeking peace with all the parties present in the Palestinian refugee camps.Due to its anti-Syrian regime stances and its opposition to the Palestinian National Authority in Ramallah,however, Hamas is sometimes accused of being two faced by some Palestinian factions: while advocating for peace and security in the camps, Hamas clandestinely uses some Jihadist groups to reduce Fatah’s ascendency other the camps. The Syrian crisis and its increasing effect on Lebanese and Palestinian politics plays into the Salafist-Jihadist narrative. This radicalization phenomenon should be put into proper perspective. Paradoxically, violence seems contained. Palestinian camps are not virgin territories: they are constituted of multiple political networks and governmentalities. Even Islamism and its radical messianic discourse are divided into several currents, with their own Palestinian translations in the camps. A multifaceted Islamism is one with elements which encourage a real inter-Palestinian mediation process: some Palestinian or Islamist factions like the Combatant Islamic Movement or Usbat al-Ansar serve as mediators, trying to stem the escalating violence. Insecurity in the refugee camps in Lebanon and the radicalization phenomenon, are indisputable, but, they still meet their limits. Palestinian refugee camps’ security instability, notably in Ain al-Hilweh, is due to the presence of Islamist radical armed groups, which gather Palestinian activists mainly, but also Lebanese, and Arabs. But the insecurity issue is not only due to the Islamist aspect. Fatah’s internal dissensions also affect the camps. There is still no unified Palestinian leadership, since Hamas and Fatah remains divided. And the fragmented Lebanese political landscape does not help Palestinians to secure the camps. Nevertheless, some positive steps have been realized, such as the creation of a Palestinian Joint Security Force, which gathers now a considerable number of Palestinian factions, from Fatah to Islamic Jihad. A certain coordination has been established between the Lebanese Army and the Palestinians, trying not to repeat the tragic example of Nahr al-Bared, in 2007. Lebanese and Palestinian stakeholders are not antagonistic to each other, and maybe understand that they could commonly benefit of an enhanced cooperation – which is unfortunately limited to a political and security dialog, and ignores, sometimes, that the multifaceted problems of the camps are also related to social issues. The opposition between "al-Lino" and Munir Muqdah, was decisive, over the past years: it proved that the setting up of the security policy in the Palestinian refugee camps is dependent on the inter-Palestinian political divisions, which concern PLO, Fatah, Hamas, and other organizations affiliated with the Syrian regime, like the PFLP-GC. The observable lack of security in the Palestinian refugee camps results essentially from these significant political divisions. Achieving a Palestinian Joint Security Force? Over the years, PLO has gradually lost its ascendancy over the Palestinian refugee camps: the Syrian presence in Lebanon between 1990 and 2005, essentially in the Northern camps (Nahr al-Bared and Baddawi), was conducive to the emergence of a gathering of multiple factions into one body, the Alliance of Palestinian Forces (APF), at-Tahalluf, who was in charge of the social issues and with the security in the camps. Most of the time, regarding the camps’ administration, APF’s popular committees (al-Lijan al-sha’abiya) were taking PLO’s place. Since the 2005 Syrian troops’ retreat, regarding the security approach in the camps, several components have been involved. The Syrian withdrawal from Lebanon allowed Fatah to reaffirm its past prominence over Palestinian camps: but it has to compete with others organizations, such as Hamas. Those organizations cooperate most of the times, but sometimes, they are opposed. They fall into two categories, the stakeholders and the intermediaries. Fatah has still a substantial role to play in the security nexus in the refugee camps: Subhi Abu Arab, a Fatah member, is currently the leader of the Higher Palestinian Security Committee, in charge of the coordination of Palestinian security policy in all the camps. The Fatah’s Armed Struggle (al-Kifah al-mussalah), is the principal organized force to deal with the Salafist issue in Ain al-Hilweh. In the camps, all the Palestinian factions, including Leftist groups, Islamist factions, or Fatah, have weaponry and militiamen at their disposal, and have their own security apparatus 40. But they approve now the concept of a Palestinian Joint Force, which would include all the tendencies. Their main concern is to not limit the presence of Salafist tendencies, which still exists in the camps, and which are totally part of their social and political landscape. The goal of the Palestinian Joint Security Force is limited, and very pragmatic: it has to avoid clashes between Salafist-Jihadist tendencies and others Palestinian factions; to negotiate with the Lebanese army the security conditions of the camps; and to limit a certain coordination between Salafist-Jihadist groups and their Syrian and Arab counterparts. The goal is not to eradicate Salafist-Jihadist movements, or to enter in a global confrontation with them at the moment – a security policy which could imply a general destabilization of the camps – it is to control them, and to find a mutual agreement between all the Palestinian stakeholders, based on this very simple idea: Palestinian camps have to distance themselves from the Syrian conflict. Two elements determine the establishment of a Joint Force. Firstly, despite being a joint alliance that gathers all Palestinian political stripes, it still proves to be under the dominance of the Fatah’s leadership, as Munir Maqdah, a Fatah member, is at its head. A Fatah official, Khaled Sakr, also supervises Mieh Mieh’s Joint Security Force. Ahmadal-Khatib a member of Hamas, is acting as Khaled Sakr’s deputy, alongside Nabil Zeidan, an Ansar Allah official, and Muhammad al-Arabi from Palestine Liberation Front (PLF), one PLO minor faction. The Palestinian Joint Security Force is theoretically a broad alliance that should turn a blind eye on all oppositions between Hamas and Fatah, and Islamists and non-Islamists, PLO factions and APF members. This joint force includes many various movements like the Islamic Jihad Movement in Palestine, Leftist movements like the Democratic Front and Popular Front, and some Islamist radical factions like Ansar Allah. But it remains on a formal level under Fatah's leadership. Nevertheless, the implementation of this currently restricted area’s Joint Force, whose effectiveness is still to be proved, is dependent on a regular inter-Palestinian dialogue between the Palestinian National and Islamist Forces involved. This alliance assembles on irregular schedules in the Embassy of Palestine or in the premises of the member organizations. Those national and Islamist forces include Fatah, PLO factions, Hamas, the Islamic Jihad Movement in Palestine, some pro-Syrian regime organizations, and 3 Islamist movements strongly present in the Southern Lebanon camps: Ansar Allah, Usbat al-Ansar and the Combatant Islamic Movement. Fathi Abu Aradat, head of Fatah Movement and of PLO in Lebanon, is one of the main figures of the Political Direction (Qiyada al-siyasiya) of the Palestinian National and Islamist Forces. -The Palestine Embassy,45which represents the Palestinian National Authority interests in Lebanon, under the direction of Palestinian Ambassador in Lebanon Ashraf Dabbour. The Palestine Embassy is only an intermediary between the Palestinian National Authority, the Palestine Liberation Organization, the Lebanese State, the Palestinian National and Islamist Forces and the Higher Palestinian Security Committee lead by Subhi Abu Arab. As a diplomatic representation, it has no central role in the chain of command. Thus, there is a double process in the creation of this Palestinian Joint Security Force: it is undoubtedly the consequence of an inter-Palestinian dialogue based on an inclusive policy but, at the same time, this Joint Force remains to a certain extent under the control of the Fatah movement and indirectly under the control of the Palestinian National Authority as a sort of guarantee for Lebanese authorities. But the Lebanese Authorities do not necessarily underestimate the actual influence of the other Palestinian organizations, like Hamas, in the refugee camps. And they also are fully aware about the divisions affecting Hamas and Fatah relationship. In May 2015, the president of the Lebanese Parliament, Nabih Berry convened a meeting in Beirut between Moussa Abu Marzouk, a Hamas senior member, and Azzam al-Ahmad, the Fatah official sent to Beirut, to encourage inter-Palestinian dialogue. For the Lebanese authorities, a durable national unity agreement between Fatah and Hamas inthe Palestinian Territories is also a first step towards security stability within refugee camps in Lebanon. Political and security Palestinians representatives are various. But in another perspective, Palestinians also have to engage various Lebanese institutions in dialogue, political parties and local movements, which have differing interests. Additionally, Palestinians in Lebanon have to face a Lebanese State, divided in two ruling political coalitions, the March 8th Alliance and the March 14th Alliance. If Lebanese authorities have to deal with a fragmented Palestinian political scene, Palestinians have also to deal with a divided Lebanese political landscape. During his visit in Lebanon, in May 2015, Azzam al-Ahmad interviews reflect the complexity of the Lebanese political arena.51 For president Mahmoud Abbas, as for the political direction of PLO and PNA, Palestinians have to be neutral when addressing their Lebanese counterparts. The same is true for Hamas. Lebanese stakeholders regarding security dialogue with the Palestinians are, the Minister of Interior and Municipalities, Nouhad Machnouk, a member of the Future Movement (led by Saad Hariri), the General Directorate of General Security (GDGS) whose head is Abbas Ibrahim, a special interlocutor, especially since the GDGS has been in charge of the Palestinian refugees from Syria, since 2012. In the past, Abbas Ibrahim was a key interlocutor for the Palestinians, as representative of the Military Intelligence in South Lebanon, between 2005 and 2008. The Internal Security Forces (ISF), which depend on the Ministry of Interior, are now concerned about the situation of Northern Lebanon’s camps. From now, it is allowed to be present and to apprehend wanted people inside the Nahr Bared camp, which is undergoing reconstruction. But Nahr Bared is a notable exception. Hizbullah is also one of the security interlocutors for Palestinians in Lebanon. First, because some of the refugee camps are under Hizbullah’s jurisdiction (Chatila, Bourj al-Brajneh), and also, because some Palestinian officials (mainly some Hamas and Palestinian Islamic Jihad representatives), are under its protection, especially in Beirut’s southern outskirts. In South Lebanon, some Palestinians are formally members of the Brigades of Resistance (Saraya al-Muqawama), a movement whose members do not belong to Hizbullah, but are military trained by the Party of God. According to some Palestinian sources of the camp, Hizbullah political direction sent a delegation to apologize to the family of Muhammad al-Samrawi, a young Palestinian killed during clashes the day after his death.57 From Hizbullah’s perespective, to preserve peaceful and domestic relationships with all Palestinian factions is a question of legitimacy: on the ideological level, “the liberation of all Palestine” is still at the core of its narrative, and its military and financial assistance to some Palestinian groups cannot be denied.58 On a pragmatic scale, the Party has to prevent any sectarian conflicts with a primarily Sunni Palestinian population often living near its popular strongholds. In regards to security concerns, positive steps towards a Lebanese-Palestinian dialogue have been obviously accomplished: Lebanese national and local figures, political parties, Intelligence services and the Lebanese Army have a history of and are still currently engaged in true colloboration with Palestinian stakeholders. Palestinians camps should not only be known as “no-law” zones, detached from their Lebanese context, disrespectful of Lebanese laws and institutions. Political transactions and negotiations are permanent. Palestinians themselves, despite their internal divisions, have shown their political willingness not to repeat the tragic example of Nahr al-Bared in 2007: by a constant and inclusive national dialogue, associating both Nationalist and Islamist forces, they try to preserve the camps from a general security deterioration– even if they can not fully curb the current rising of Salafist-Jihadist movements in Palestinian camps. Nevertheless, this Lebanese-Palestinian dialogue is still burdened by a number of problems. With Fatah’s internal crisis still not resolved, and the aftermath of the confrontation between Muhammad Dahlan’s partisans and Mahmoud Abbas’s supporters being felt in Palestinian camps, the cohesion of the Palestinian leadership in Lebanon could be affected in the near future. This is all the more important given that Fatah remains a major interlocutor for Lebanese authorities. The collaboration between Islamist forces and Fatah movement is a positive step: but the recent failure of the national unity government, in Palestinian Territories 59, between Hamas and Fatah, could easily threat the fragile coexistence that they have in Lebanon. Even the Lebanese political field is not entirely secure: if March 8 and March 14 are remain at a stalemate in the process of national dialogue, despite the consequences of the Syrian crisis on the political field, the Lebanese institutions will remain weak. Palestinian national unity is surely a precondition for the Lebanese national security; but the Lebanese stability is also a prerequisite for the steadiness of Palestinian refugee camps. The impact of the Syrian crisis on the Palestinian refugee camps in Lebanon is tangible: subsequent influx of Palestinian population from Syria, coordination between Palestinian Salafist armed groups and Jabhat al-Nusra, recurring armed clashes between Fatah and Jund al-Sham militiamen. And despite being under the control of Lebanese army, Ain al-Hilweh is the most exposed camp to rising insecurity. But, in spite of the inter-Palestinian and inter-Lebanese dissensions, the violence is still contained. The Palestinian Islamist scene in Lebanon is a multifaceted reality: some movements are undeniably subjected to a process of radicalization in the camps, but others are striving not to export the Syrian crisis on the Palestinian and Lebanese scenes. A dialogue about security concerns has been initiated between Palestinians and Lebanese. While the concept of Palestinian Joint Force is still in its early stages, it reflects the Palestinians’ willingness to secure the refugee camps, by joining forces with all political actors in the process. Nevertheless, this process is still endangered by some worrying dynamics: internal dissensions inside Fatah Movement, risks of splits between Hamas and Fatah, and, at least, permanent instability of the Lebanese institutions. Threats to security stability are not solely due to the presence of some Salafist armed groups: Palestinian social deprivation may constitute in the future a major destabilizing factor, worsened by the recent influx of precarious Palestinian population from Syria. Throughout May and June 2015, several non-violent sit-ins have been staged from the Northern to the Southern Palestinian refugee camps in Lebanon. On the 2nd June 2015, the Palestinian National and Islamist Forces meeting in Beirut’s Palestine Embassy have supported the camps protestors’ demands,60 who protest against the United Nations Relief and Works Agency (UNRWA) cuts on the camps budget (Taqlis). From the Palestinian refugee perspective, the current and future insecurity is not only political, but also social. Abdallah al-Azzam Brigades: they are transnational Salafist brigades, affiliated with al-Qaeda. They were led by a Saudi activist, Majid al-Majid, until his death in Lebanon in January 2014. The Abdallah al-Azzam Brigades are responsible for some attacks against Lebanese Shite areas and against the Iranian Embassy in 2013. Some of their activists are now based in Ain al-Hilweh refugee camp. Amal (Afwaj al-Muqawama al-Lubnaniya, Lebanese Resistance Regiments): it is a Shiite movement, originally founded in 1975 by Imam Moussa Sadr, under the name of “Movement of the dispossessed” (Haraka al-Mahrumin). During the 80’s, Amal Movement was strongly opposed to PLO and to Fatah movement, and besieged Palestinian refugee camps in Lebanon. Today, Amal Movement and its main leader, Nabi Berri, who is also President of the Lebanese Parliament, are key interlocutors for Palestinian leadership in Lebanon, and the relationship between PLO and Amal movement have been pacified. Armed Struggle (al-Kifah al-musallah): it is a Palestinian security force, with close links to Fatah movement. The Armed Struggle is mainly present in Ain al-Hilweh refugee camp. Its former leader, Mahmoud Abdel Hamid Issa (Lino), is today close to Muhammad Dahlan, a Palestinian leader excluded from Fatah Movement in 2011. Ansar Allah (The Partisans of God): it is a Palestinian Islamist group mainly based in Ain al-Hilweh and Mieh Mieh refugee camps, near Sidon. The Sheikh Jamal Suleiman, a former member of Fatah Movement during the eighties, leads it. It has close links with the Lebanese Hizbullah since the early nineties, although both movements opposed each other in 2012 and 2013 for internal reasons. Combatant Islamic Movement (al-Haraka al-islamiya al-mujahida): led by Sheikh Jamal Khattab, it is an Islamist organization mainly based in Ain al-Helweh refugee camp. It is regularly involved in a series of mediations between PLO affiliated factions and Salafist organizations. Democratic Front for the Liberation of Palestine (DFLP, al-Jabha al-dimukratiya li-Tahrir Filastin): it is a leftist organization, born as a splinter group of the Popular Front for the Liberation of Palestine (PFLP). It is born in 1969, and is still led by Nayaf Hawatmeh. Today, the movement keeps a political and military presence in Palestinian refugee camps in Lebanon. Some of its rank-and-file members are part of the newly created Palestinian Joint Security Force. Ali Faysal represents the DFLP in Lebanon. Fatah (Palestinian National Liberation Movement, Haraka al-Tahrir al-watani al-filistini): the Movement is officially born in 1959, in Kuwait, under the direction of Yasser Arafat, Abu Jihad and Abu Iyad. Fatah remains one of the most important Palestinian political organizations, in the Palestinian Territories as in the Palestinian Diaspora. Fatah is still torn between several factions and leaderships. Its main leaders in Lebanon since the early nineties are Munir Maqdah, Muhammmad Abdel Hamid Issa (Lino), Subhi Abu Arab, Fathi Abu Aradat and Sultan Abu Aynan (The latter is now based in Ramallah since 2010, as member of the Fatah’s Central Committee). Fatah al-Intifada: it is a splinter group of Fatah Movement, born in 1983, under the direction of Abu Moussa. It has close links with the damascene authorities, and is member of the Palestinian Forces Alliance (at-Tahalluf). Fatah al-Islam (the Conquest of Islam): the Fatah al-Islam appears in 2006 in the Palestinian refugee camp of Nahr al-Bared, in North Lebanon. It was lead, at its beginning, by Shaker al-Absi, a former member of the Fatah al-Intifada, a political party with close links with Damascus. With its radical Salafist inspiration, the Fatah al-Islam led a war against the Lebanese Army in Nahr al-Bared, from May to September 2007. Today, the Fatah al-Islam is no longer present in Nahr al-Bared. It has a strong presence in the Palestinian refugee camp of Ain al-Helweh, near Sidon. Since the death of Shaker al-Absi, in December 2008, one if its leader is Bilal Badr, based in Ain al-Hilweh. Hamas (Islamic Resistance Movement, al-Haraka al-Muqawama al-islamiya): Hamas is born in December 1987 in the Palestinian Occupied Territories. Inspired by the ideology of the Muslim Brothers, it is one of the most important Palestinian political organizations today. Hamas is not a member of the PLO. The Movement has a strong political presence in Palestinian refugee camps. Its representative in Lebanon is Ali Barake. Higher Palestinian Security Committee (al-Lajna al-amniya al-ulia al-filistiniya): led by Sobhi Abu Arab, a member of Fatah Movement in Lebanon, the Higher Palestinian Security Committee is in charge of the security of Palestinian refugee camps in Lebanon. It works in coordination with the Palestinian Embassy in Lebanon, with the Political Direction of the Palestinian national and Islamic Forces, with Lebanese authorities, and with the newly created Palestinian Joint Security Force, since February 2015. Hizbullah ( the Party of God): officially founded in February 1985, the Party is predominant in the Shiite Muslim community of Lebanon. Its military branch, the Islamic Resistance in Lebanon (IRL), has been the main opponent to the Israeli occupation from the mid 80’s to 2000, until the Israeli withdrawal from South Lebanon. Hizbullah took also credit of its resistance against the Israeli army in July and August 2006. Hizbullah is represented in the Lebanese Parliament through its “Loyalty to the Resistance Bloc”. Since 1992, its main representatives are Sayyid Hassan Nasrallah, its Secretary General, and Sheikh Naim al-Qassem, its Deputy Secretary General. Jama’ al-islamiyya ( the Islamic Community): it is the Lebanese branch of the Muslim Brothers, today led by Azzam al-Ayoubi. It was founded in 1964, under the direction of Fathi Yakan, who latter left the Brotherhood, to create the Islamic Action Front, in 2006. Jund al-Sham (the Soldiers of the Levant): it is a radical Salafist organization, mainly based in Ain al-Hilweh refugee camp, composed of both Arab, Lebanese and Palestinian activists. It appeared in the camp in 2004, under the direction of Abu Youssef al-Sharquieh, who passed away in January 2014. Jund al-Sham is regularly involved in military clashes with Fatah movement, and with others PLO affiliated factions. Lebanese Brigades for the Resistance against the Israeli Occupation (Saraya al-lubnaniya li-Muqawama al-Ihtilal al-isra’ili): Born in 1997, the Lebanese Brigades gather Lebanese fighters close to Hizbullah, but non-members of the Party. They have been involved in a series of military clashes in Sidon in June 2013, against the partisans of Sheikh Ahmad al-Assir. Islamic Jihad Movement in Palestine, or Palestinian Islamic Jihad (IJMP, al-Haraka al-Jihad al-islami fi-Filistin): born in the eighties, particularly implemented in the Gaza Strip, its main leader was Fathi Shiqaqi, a former Muslim Brother who split with the Brotherhood in 1979. He was assassinated by Mossad in 1995 in Malta. Led today by Ramadan Shallah, the Movement has strong ties with Teheran and with the Lebanese Hizbullah. In Lebanon, its representative is Abu Imad Rifaï. Islamic State (IS, al-Dawla al-islamiya): The Islamic State, led by Abu Bakr al-Baghdadi, takes its origin in the Islamic State in Iraq, born in 2006, then in the Islamic State in Iraq and Levant (ISIL), created in 2012, after a split from al-Qaeda affiliated movement Support Front, led by Abu Muhammad al-Jolani. Its presence in Palestinian refugee camps in Lebanon still remains limited, although the Islamic State has increasingly developed its political and military structures in Syria and Iraq since 2012. Martyrs of Return Battalions (Kata’ib Shuhada al-‘Awda): it is an armed faction, affiliated with Fatah Movement, based in Mieh Mieh refugee camp, and led by Ahmad Rachid. He was killed in April 2014, during clashes with Ansar Allah. It is suspected that the Martyrs of Return have close links with ex-Fatah Leader Muhammad Dahlan, who is opposed to the President of the Palestinian National Authority, Mahmoud Abbas. Musala al-Maqdissi (The Maqdissi’s Oratory): it is a small Palestinian Salafist group, based in the Taytaba district of Ayn al-Hilweh, led by Sheikh Iyad Deheisheh. In 2015, it has been regularly involved in fighting with Fatah movement and other Palestinian factions. Palestine Embassy: as diplomatic representation of the Palestinian National Authority, the Palestine Embassy replaces, since 2011, the ancient Delegation of PLO in Lebanon. The current Palestinian Ambassador is Ashraf Dabbour. As his predecessors (Abbas Zaki, Abdallah Abdallah), he is a member of Fatah movement. Palestinian Joint Security Force (al-Quwa al-amniya al-filistiniya al-mushtaraka): it has been created in February 2015, under the direction of Munir Maqdah, a Fatah military representative in Ain al-Hilweh refugee camp. It works in coordination with the Lebanese authorities, with the Palestinian Embassy in Lebanon and with the Higher Palestinian Security Committee led by Subhi Abu Arab. The Palestinian Joint Security Force is now deployed in the refugee camps of Ain al-Helweh and Mieh Mieh, near Sidon. It is mainly composed of activists of Fatah Movement and PLO affiliated factions, but also of members of Hamas, Palestinian Islamic Jihad and Ansar Allah. Palestinian Follow-up Committees (Lijan al-mutaba’a al-filistiniya): these committees are implemented in each Palestinian refugee camps, and are composed of all Palestinian factions. These committees coordinate their activities with the Palestinian national and Islamic Forces, with the Higher Palestinian Security Committee and with the Palestine Embassy. Palestinian Forces Alliance (al-Tahalluf): it isa gathering of Palestinian political parties, founded in 1993 in Damascus, strongly opposed to the Oslo Agreements and to the policy of PLO. The presence of the Palestinian Forces Alliance, from 1989 to 2005, was particularly strong in Palestinian refugee camps in Lebanon, due to its links with the Syrian authorities. Palestine Liberation Organization (PLO): founded in 1964. Its first chairman was Ahmad al-Shuqayri. Yasser Arafat succeeded him in 1968, until his death in November 2004. Mahmoud Abbas is the current chairman of PLO. The political prerogatives of the PLO have been reduced after the implementation of the Palestinian National Authority (PNA) in the Palestinian Territories after the Oslo Agreements (1993). Its current representative in Lebanon is Fathi Abu Aradat. Palestine Liberation Front (PLF, Jabaha Tahrir Filistin): the Palestine Liberation Front was founded in 1977. It is a splinter group of the PFLP-General Command. Its main leader was Abu Abbas (Muhammad al-Zeidan), who died in Iraq on March 2004. In Lebanon Palestinian refugee camps, the Palestinian Liberation Front is active in the Palestinian Joint Security Forces. Palestinian National and Islamic Forces (al-Quwa al-filistiniya al-wataniya wa al-islamiya): it gathers PLO affiliated factions, Islamist organizations such as the Hamas, the Palestinian Islamic Jihad, Usbat al-Ansar, Ansar Allah, the Combatant Islamic Movement, and the factions of the Palestinian Forces Alliance (at-Tahalluf). Fathi Abu Aradat, head of Fatah and of PLO in Lebanon, is one of their main important representatives towards the Palestine Embassy and the Lebanese authorities. Popular Committees (al-Lijan al-sha’abiya): during the 70’s and the 80’s, the Popular Committees are PLO affiliated. They were in charge of the security of Palestinian camps, as well as of welfare and development programs of PLO. Since the early 90’s, it exists two structures of Popular Committees: those of PLO, and those of the Palestinian Forces Alliance, close to Damascus. Popular Front for the Liberation of Palestine (PFLP, al-Jabha al-sha’abiya li-Tahrir Filistin): it is one of the most important Palestinian leftist organizations, born in 1967, under the direction of Georges Habache. The PFLP is member of the PLO, although it was strongly opposed to Yasser Arafat and to the Oslo Agreements. The Popular Front keeps a political and military apparatus in Palestinian refugee camps in Lebanon, and its members are part of the newly created Palestinian Joint Security Force. Its main representative in Lebanon are Khaled Barakat and Marwan Abdul ‘Al. Popular Front for the Liberation of Palestine – General Command (PFLP-GC, al-Jabaha al-sha’abiya li-Tahrir Filistin- al-Qiyada al-‘ama): it is a splinter group of the leftist PFLP, born in 1968, under the direction of Ahmad Jibril. The FPLP-GC is still close to Damascus, and member of the Palestinian Alliance Forces (at-Tahalluf). It keeps a military and political apparatus in Lebanon. Its representative in Lebanon is Imad Ramiz. Popular Nasserite Organization (Tandhim al-sha’abi al-nasri): this organization is born in 1973, and was member of the National Lebanese Movement. During the Lebanese civil war, It was close to PLO. It has always been implemented in the region of Sidon. Osama Saad, its current General Secretary, has been Member of the Lebanese Parliament, from 2002 to 2009. Sa'iqa (Popular liberation War Vanguards): it is the Palestinian branch of the Syrian tendency of Baath Party. Its activities are very limited in Lebanon today. 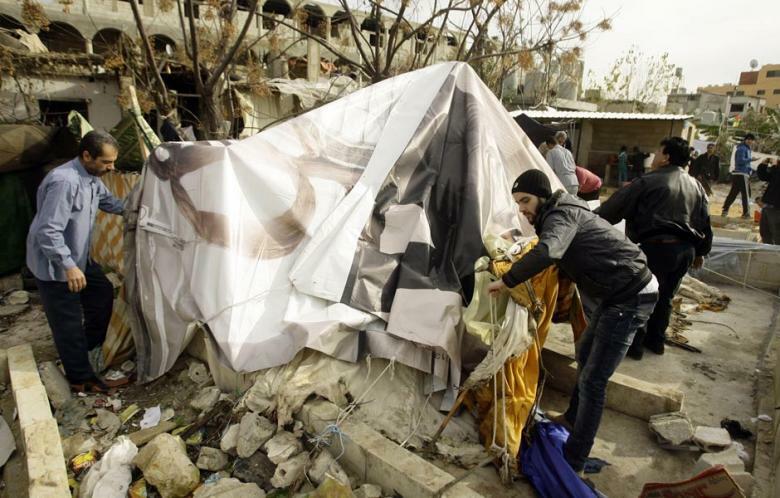 In February 2013, its offices in Ain al-Helweh refugee camp have been attacked by the Fatah al-Islam. Shabab al-Muslim ( The Muslim Youth): It is a Salafist-Jihadist group, mainly based in Ain al-Hilweh refugee camp, in the areas of Taware and Tamare. It has close links with the Syrian Support Front (Jabhat an-Nusra). Support Front (Jabhat an-Nusra): officially founded in January 2012, the Support Front is the Syrian branch of al-Qaeda. It is led by Abu Muhammad al-Jolani. The Support Front has a small military presence in Lebanon, in the eastern part of the country. Usbat al-Ansar (the Partisans League): founded in 1985 by Sheikh Hisham Shraidi, the Partisans League is an Islamist organization particularly implemented in Ain al-Helweh refugee camp. Its main representative today is Sheikh Abu Sharif al-‘Aql. Until now, Usbat al-Ansar maintains lines of communications with the vast majority of Palestinian political parties in refugee camps. 2. Statistics regarding the number of refugees are contested. According to UNRWA (The United Nations Relief and Works Agency) the number of refugees is estimated between 350.000 and 450.000. But, independent sources tend to lower the number of refugees estimated, mainly due to emigration movements after Lebanese civil war, cf. International Crisis Group, "Nurturing Instability: Lebanon Palestinian’s Refugee camps", Middle East Report N 84, English, 19 February 2009, http://www.crisisgroup.org/~/media/Files/Middle%20East%20North%20Africa/Israel%20Palestine/84%20nurturing%20instability%20lebanons%20palestinian%20refugee%20camps.pdf [last accessed September 28, 2015]. 3. Sari Hanafi, "Palestinian Camps in Lebanon as a Space of Exception", in Kamel Doraï and Nicolas Puig (Eds. ), Revue Asylon(s), Palestiniens en/hors camps, French, September 2008, http://reseau-terra.eu/article798.html[last accessed September 28, 2015]. 4. Cf glossary at the end of the paper. 5. Shakir al-Absi was, during the 80’s, a prominent officer of the Fatah-Intifada, a pro-Syrian regime Palestinian faction. He was killed in Syria in December 2008. 6. United Nations Relief and Works Agency, English, 2014, http://www.unrwa.org/prs-lebanon[last accessed September 16, 2015]. 7. Are Knudsen, “Islamism in the Diaspora: Palestinian Refugees in Lebanon”, Journal of Refugee Studies, Vol. 18, N 2, Oxford University Press, English, 2005. 8. Interviews of the author with Palestinian refugees of Chatila and Burj al-Brajneh camps in May 2015. 9. Racha Salah, “Ana min ‘Ain al-Hilweh” ( I am from Ain al-Hilweh), as-Safir Filistin, Arabic, March 2015, http://palestine.assafir.com/Article.aspx?ArticleID=3235 [last accessed September 28, 2015]. 10. Ana Maria Luca and Amin Nasr, "Mu’adhala ‘Ayn al-Helweh " (Ain al-Hilweh Dilemma), Now Media, Arabic, 17 February 2015, http://now.mmedia.me/lb/ar/تحقيقات/565146-معضلة-عين-الحلوة [last accessed September 28, 2015]. 11. Some other militant groups like Shabab al-Muslim or Musala al-maqdissi are also active in Taware and Tamire districts. Lebanese press reports that since 2013 those groups are looking forward an unification like Syrian Jabaha an-Nusra, but nothing concrete has been achieved yet. (Amal Khalil and Qassem Qassem, “An-Nusra Front: Seeking a Lebanese Base in Ain al-Hilweh”, Al-Akhbar English, English, February 4, 2013, http://english.al-akhbar.com/content/al-nusra-front-seeking-lebanese-base-ain-al-helweh) [last accessed September 28, 2015]. 12. In January 2013, demonstrations of Palestinian refugees from Syria have been held in front of al- Sa'iqa’s office in Ain el-Hilweh. Protestors asked Palestinian authorities to remove all the signs and banners of al- Sa'iqa’s branch in the camp. After being attacked in February 2013, al- Sa'iqa’s office has been effectively closed, and transformed into an headquarter of the Palestinian Follow-up Committee (Lajna al-mutaba’ al-filistiniya), after an agreement madebetween al- Sa'iqa, Fatah Movement, the Combatant Islamic Movement and other Palestinian factions. 13. PFLP-GC has been obviously weakened since the military withdrawal of the Syrian Army from Lebanon, in 2005. Nevertheless, it keeps a strong presence in Lebanon, as a political party implemented in many camps, and through some military bases outside refugee camps in the Bekaa Valley, whose 14 March Alliance still demands for the dismantlement. 14. Nasser Charara, "Salafist Factions on Rise at Palestinian Camp in Lebanon", Al Monitor, English, March 13, 2013, http://www.al-monitor.com/pulse/originals/2013/03/ain-al-hilweh-looming-battle.html [last accessed September 28, 2015]. 15. Ali Hashem, “Al-Qaeda Affiliated Emir Arrested in Lebanon”, Al Monitor, English, January 1, 2014, http://www.al-monitor.com/pulse/originals/2013/12/abdullah-azzam-emir-custody-hashem.html# [last accessedSeptember 28, 2015]. 16. Sheikh Ahmed al-Assir was arrested by the Lebanese authorities at the Beirut Rafiq Hariri International Airport on August 15, 2015. 17. Romain Caillet, « Le phénomène Ahmad al-Assir : nouveau visage du salafisme au Liban ? », Les Carnets de l’Ifpo, Français, March 9, 2012, http://ifpo.hypotheses.org/3240 [last accessed September 28, 2015]. 18. Although the Lebanese Resistance Brigades, founded in 1997, are mainly composed of Lebanese rank-and-file members close to Hizbullah, but who are not members of the Party, some Palestinian sources affirm that the Resistance Brigades recruited, these last years, a small share of Palestinian activists in the camps. See : Muhammad Zaatari, “Hezbollah Reactiving Resistance Brigades in Sidon”, The Daily Star, English, April 4, 2014, http://www.dailystar.com.lb/News/Lebanon-News/2014/Apr-04/252252-hezbollah-reactivating-resistance-brigades-in-sidon.ashx [last accessed September 28, 2015]. 19. « Muqtal Ahd Shabab Mukhayyam ‘Ayn al-Hilweh fi-Suria athna’ qatalihi ma’ Tandhim al-Dawla al-islamiya», (Death of a young man of Ain al-Hilweh in Syria during clashes with the organization of the Islamic State), Saïda Gate, Arabic, 14 June 2015, http://www.saidagate.net/Show-55137 [last accessed September 28, 2015]. 20. Nicolas Dot-Pouillard, « Yarmouk : divisions palestiniennes face à l’Etat islamique », Orient XXI, French, April 14, 2015, http://orientxxi.info/magazine/yarmouk-divisions-palestiniennes,0870 [last accessed September 28, 2015]. 21. Muhammad al-Zaatari, “Elite Forces deploy in volatile parts of Ain al-Hilweh », The Daily Star, English, May 20, 2015, http://www.dailystar.com.lb/News/Lebanon-News/2015/May-20/298611-elite-forces-deploy-in-volatile-part-of-ain-al-hilweh.ashx [last accessed September 28, 2015]. 22. Shreidi was murdered in 1991. 23. ,Ahmad al-Musalli, "Usbat al-Ansar", Mawsu’a al-Harakat al-islamiya fi al-Watan al-‘arabi wa Iran wa Turkiyya (Encyclopedia of Islamist Movements in the Arab World, Iran and Turkey), The Studies Center for Arab Unity, Beirut, Arabic, 1999, p 344. See also Jabar Suleiman, “The Current Political, Organizational and Security Situation in the Palestinian Refugee Camps of Lebanon”, Journal of Palestine Studies, Vol. 29, N. 1, English, Autumn, 1999, pp. 66-80, http://www.palestine-studies.org/sites/default/files/jps-articles/2676432.pdf [last accessed September 28, 2015]. 24. "Al-Qiyada al-siyasiya al-filastiniya fi-Mintaqa Saida ta’qidu Ijtima’iha al-dawri fi-Maqr al-Haraka al-islamiya al-mujahida" (The Palestinian Political Direction in the region of Saida holds its meeting at the office of the Combatant Islamic Movement), Combatant Islamic Movement’s website, Arabic, 2 June 2015, http://www.harakamojahida.com/news.php?action=view&id=2836 [last accessed September 28, 2015]. 25. Sheikh Maher Hammoud is a prominent Lebanese preacher, born in 1953, based in Sidon, at al-Quds Mosque. He keeps strong links with Hizbullah, although he was critical of Hizbullah’s involvement in Syria in 2012. 26. « Al-Jihad tuhawiru Arba’ Qiyadiyin : Azma Hay al-Taware tu’aliju ‘ala Nar hadi’a amnian » (Al-Jihad gathers four leaders : Taware area’s crisis is calming down), Al-Jihad, Monthly publication of the Palestinian Islamic Jihad in Lebanon, Arabic, May 2015, p 3. 27. Amar Naameh, "Hamas li-l-Lubnaniyin : Tawrit al-filistini iu’adhikum", (Hamas to the Lebanese : instability is damaging you), as-Safir, Arabic, 11 February 2015, http://assafir.com/Article/2/401388 [last accessed September 28, 2015]. 28. “Hezbollah-linked Man Found Shot Dead in a Trunk of a Car in Lebanon Camp”, Yalibnan, English, April 6, 2015, http://yalibnan.com/2015/04/06/hezbollah-member-found-shot-dead-in-a-truck-of-a-car-in-lebanon-camp/ [last accessed September 28, 2015]. 29. Interviews of the author with representatives of the Popular Front for the Liberation of Palestine (PFLP) and of the Democratic Front for the Liberation of Palestine (DFLP) in Beirut on February and June 2015. 30. Adnan Abu Amer, “Palestinian Refugee Camp in Lebanon becomes Battlefield for Fatah-Islamist Conflict”, Al Monitor, English, September 4, 2015, http://www.al-monitor.com/pulse/originals/2015/09/lebanon-ain-hilweh-camp-palestinian-refugees-tension-clashes.html [last accessed September 28, 2015]. 31. Fatah officially dismissed Lino, in 2013. 32. In 1990’s, Munir Maqdah is one of the internal opponents within Fatah, who condemned Oslo Accords, in 1993. 33. Amal Khalil, “Inqilab Dubbat Fatah iatarannahu” (The putsh of Fatah’s officers is reeling), Al Akhbar, Arabic, July 23, 2013, http://al-akhbar.com/node/191847 [last accessed September 28, 2015]. 34. Interviews of the author with Fatah representatives in Amman, Ramallah and Beirut in December 2014 and June 2015. 35. Muhammad Zaatari, “Fear of Escalation Puts Ain al-Hilweh on Edge”, The Daily Star, English, March 19, 2015, http://www.dailystar.com.lb/News/Lebanon-News/2014/Mar-19/250661-fear-of-escalation-puts-ain-al-hilweh-on-edge.ashx [last accessed September 28, 2015]. 36. Ansar Allah militiamen killed Ahmad Rachid during these short military clashes. 37. Observation of the author in Palestinian refugee camps (Chatila, Burj al-Brajneh) in May and June 2015. 38. Rana Harbi, “The Fight Against Fundamentalist Recruitment of Palestinian Youth in Ain el-Hilweh”, Al-Akhbar English, English, June 5, 2014, http://english.al-akhbar.com/node/20055 [last accessed September 28, 2015]. 39. Abu Imad Rifaï, “Hal al-Matlub Tadmir Ain al-Hilweh bi-Adawat filistiniya?” (Is it Required to Destroy Ain al-Hilweh by Palestinian Hands? ), Palestinian Refugees news Network in Lebanon, Arabic, August 25, 2015, http://laji-net.net/arabic/default.asp?ContentID=42908&menuID=21 [last accessed September 28, 2015]. 40. Interviews of the author with representatives of Fatah, PFLP and Palestinian Islamic Jihad in Beirut in June 2015. 41. Interview of the author with a representative of Fatah movement in July 2015. 42. The Palestinian Joint Force has been official since February 2015, but that does not mean there was no joint initiative previously. They did exist, but they were not official neither coordinated. 43. Interview of the author with representatives of Palestinian Popular Committees in Burj al-Brajneh in June 2015. 44. Interviews with Palestinian refugees of Nahr al-Bared camp. See also : Ismaël Sheikh Hassan and Sari Hanafi, “(In)security and Reconstruction in Post-conflict Nahr al-Barid Refugee Camp”, Journal Of Palestine Studies, Vol. 40, N. 1, Autumn 2010, pp 27-48,http://www.palestine-studies.org/sites/default/files/jps-articles/(In)Security%20and%20Reconstruction%20in%20Post-conflict%20Nahr%20al-Barid%20Refugee%20Camp.pdf [last accessed September 28, 2015]. 45. Lebanese authorities have officially recognized the Palestine Embassy in 2011. Before, Palestinian Ambassadors had only the status of “representatives of the Executive Committee of the Palestinian Liberation Organization in Lebanon”. 46. Azzam al-Ahmad is a member of the Fatah’s Revolutionary Command (al-Majlis al-thawri), since 1989, and the former Minister of Communications in the Palestinian National Authority Government (2003-2006). 47. Interviews of the author with representatives of the Fatah’s Arab Affairs Department in Beiruth in June 2015. 48. Interview of the author with representatives of Fatah in Beirut in June 2015. 49. Interview with Palestinian security representatives in Mar Elias Camp in June 2015. 50. Soufian Abu Zayda, “Wasata al-Liwa’ ‘Abbas Ibrahim wa al-Musalaha beyna al-Ra’is ‘Abbas wa Dahlan” (The Mediation of General Abbas Ibrahim and the Conciliation Between President Abbas and Dahlan), Ra’i al-Yaym (Today’s Opinion), Arabic, April 22, 2015, http://www.raialyoum.com/?p=247390 [last accessed September 28, 2015]. 51. Haitham Zaitar, “Hakadha najaha Berri bi-‘aqad Liqa’ mushtarak beina wafadayn Fatah wa Hamas” (Berri Managed to Held a Joint Meeting Between the Delegations of Fatah and Hamas), Tayyar.org, Arabic, May 13, 2015, http://www.tayyar.org/News/Print/4377 and “Fatah, Hamas Discuss with Lebanese Parliament Speaker on Palestinian Reconciliation”, Xinhuanet.com, English, May 8, 2015, http://news.xinhuanet.com/english/2015-05/08/c_134219440.htm [last accessed September 28, 2015]. 52. Mohamed Kamel Doraï, Les réfugiés palestiniens du Liban. Une géographie de l’exil, CNRS Editions, Paris, 2006, pp 143-169. 53. Beirut refugee camps, are not concerned by this rule as they do not depend on Lebanese army. 54. “Iftar al-Haras al-thawri wa al-Tandhim al-dawli li-l-Ikhwan fi Beirut: hal istahadafu Misr?”, (Dinner of the Revolutionary Guard and of the International Organization of the Brothers in Beirut: what is seeking Egypt? ), Bawaba al-Harakat al-islamiya, Arabic, July 6, 2015, http://www.islamist-movements.com/30259 [last accessed September 28, 2015]. 55. Wissam Alhaj, Nicolas Dot-Pouillard and Eugénie Rébillard, De la théologie à la libération : une histoire du Jihad islamique palestinien, Editions la Découverte, Paris, 2014, Chapter 4. 56. “One Dead, Five Hurt as Hezbollah Members Clash with Palestinians in Burj al-Brajneh”, NaharnetDesk, English, September 8, 2013, http://www.naharnet.com/stories/en/97318 [last accessed September 28, 2015]. 57. Interview of the author with Palestinian representatives of Burj al-Brajneh refugee campon May 2015. 58. Wissam Alhaj and Nicolas Dot-Pouillard, “Pourquoi le Hamas et le Hezbollah restent quand même alliés: au-délà de la crise syrienne et du clivage entre sunnites et chiites”, Orient XXI, French, March 9, 2015, http://orientxxi.info/magazine/pourquoi-le-hamas-et-le-hezbollah,0831 [last accessed September 28, 2015]. 59. Adnan Abu Amer, “Gaza Deputy Minister: PA Behind Recent Bombings”, Al Monitor Middle East, English, June 21, 2015, http://www.al-monitor.com/pulse/originals/2015/06/palestine-plo-kamel-abu-madi-interview-israel-negotiations.html [last accessed September 28, 2015]. 60. "Bian sader ‘an al-Quwa wa al-Fasa’il al-wataniya wa al-islamiya al-filistiniya fi-Lubnan " (Statement of the Patriotic, Islamic and Palestinian factions in Lebanon), Palestinian State Embassy in Lebanon, Arabic, May 26, 2015, http://www.palembassy-lb.net/_news.php?news_id=10749 [last accessed September 28, 2015]. Nicolas Dot-Pouillard is an Associate Researcher at Ifpo (French Institute for the Near-East), in Beirut, Lebanon, and Core-Researcher with the “Wafaw Programme” (When authoritarianism fails in the Arab world, European Research Council). He is also a regular contributor to Orient XXI and Le Monde diplomatique. He has published two books: Tunisia: the Revolution and its Pasts (Tunisie: la révolution et ses passés, Iremmo/ L’Harmattan, 2013), and, with his co-authors Wissam Alhaj and Eugénie Rébillard, From Theology to Liberation: a History of the Palestinian Islamic Jihad (De la théologie à la liberation: une histoire du Jihad islamique palestinien, Editions La découverte, 2014).